Vetroflex Intense by animalife is a proprietary supplement designed to provide a high level of nutritional support ahead of, or immediately after intense work to help improve performance and aid recovery after exertion. It combines specific amino acids, powerful plant-based antioxidants and joint and muscle support nutrients together with a prebiotic. 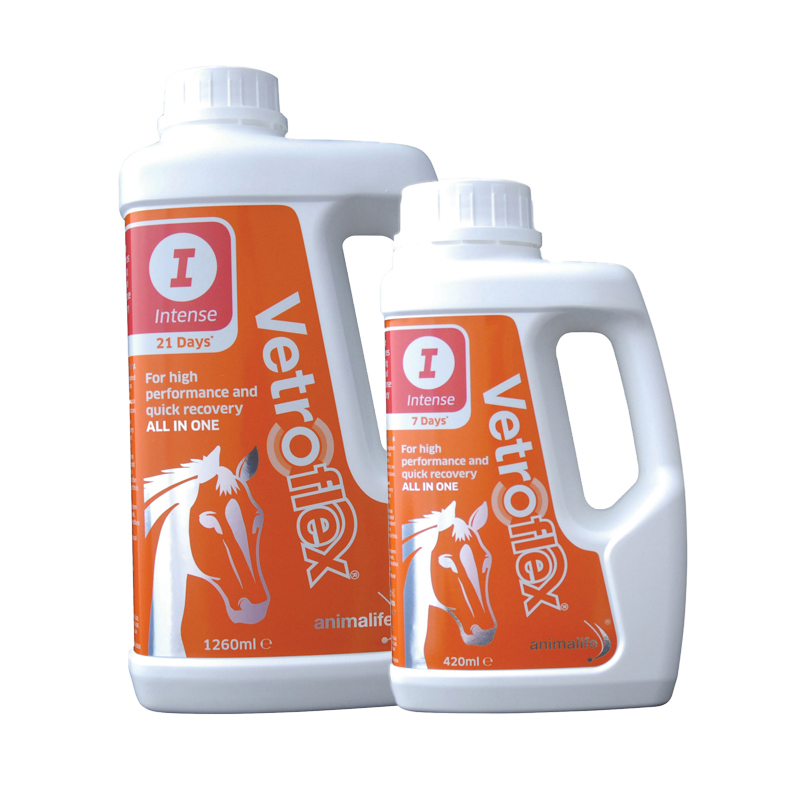 Vetroflex Intense is free from banned substances and is safe to use with the performance horse. Vetroflex Intense works in four ways to provide additional support to the equine athlete. Collagen hydrolysate supplies a rich blend of peptides that are broken down to amino acids that accumulate in the cartilage and other connective tissues, with a positive impact on the synthesis of joint matrix compounds. Also containing a special antioxidant formula called ABC-Flex, a proprietary blend of Acacia catechu, Boswellia and Curcumin, with black pepper to aid absorption, which delivers specific plant phytochemicals that work together to provide support to the joints, muscles and immune system. These ingredients combine with MSM, L-Carnitine, Nucleotides, Melon extract (Superoxide Dismutase) and FOS prebiotics to offer support during and after performance. Intense workouts put strain on not only the musculoskeletal system but also the supporting digestive and immune systems. Vetroflex Intense is designed to support each of these functions with targeted nutrients. Vetroflex Intense is designed to help improve performance and aid recovery after exertion. Joint support: via provision of targeted amino acids from collagen hydrolysate; plus MSM and antioxidants to support healthy cartilage and connective tissue metabolism, so important in the maintenance of joint function. Muscle support: the muscles work hard during intense exercise. To aid recovery after exertion using targeted plant derived antioxidants, nucleotides and L-carnitine. Digestive support: horses in intense work and at competition may have disrupted daily routines and unavoidable changes in diet – the inclusion of a prebiotic supports the optimal function of the digestive system at this challenging time. Immune support: The immune system is challenged particularly after intense work. The powerful plant phytochemicals in Vetroflex Intense work synergistically to provide support to help strengthen the body’s natural antioxidant defences.